S&S Racers Matt Smith and Chaz Kennedy made the semifinals at the Lucas Oil Nationals at Brainerd International Raceway in Minnesota. Hector Arana Jr. was able to maintain his number two position in the Mello Yello championship points with only one more event on the schedule before the championship Countdown begins. Brainerd saw a short bike count with only 15 competitors making the trip to the most northern event on the tour. The event also saw some rough weather, as rain cancelled a qualifying session on Saturday and delayed Sunday’s eliminations by three hours. The Harley-Davidson team of Eddie Krawiec and Andrew Hines qualified in the top two positions and met in the finals where Krawiec took his third straight win. Matt Smith made the semifinals for the second time this year on his S&S-powered Victory Gunner. The former series champ qualified sixth at 6.991 at a soft 188 mph, no doubt due to his continuing struggles with the aerodynamics of his new ride. Smith met Krawiec in the semis, and got the holeshot, but lost to Krawiec for the eighth time in 11 semifinal matchups. Hector Arana Jr. was the top S&S-powered qualifier in the field, running 6.951 seconds at the top speed of qualifying, 193.88 mph. After he took out Angie Smith in round one, husband Matt took him out in round two. Second year PSM competitor Chaz Kennedy is riding for UPI Performance out of Ohio this year after spending his rookie season under the tutelage of George Bryce of Star Racing. Kennedy bounced back from his DNQ at Sonoma with his second semifinal showing of the year meeting reigning series champ Andrew Hines in round three. 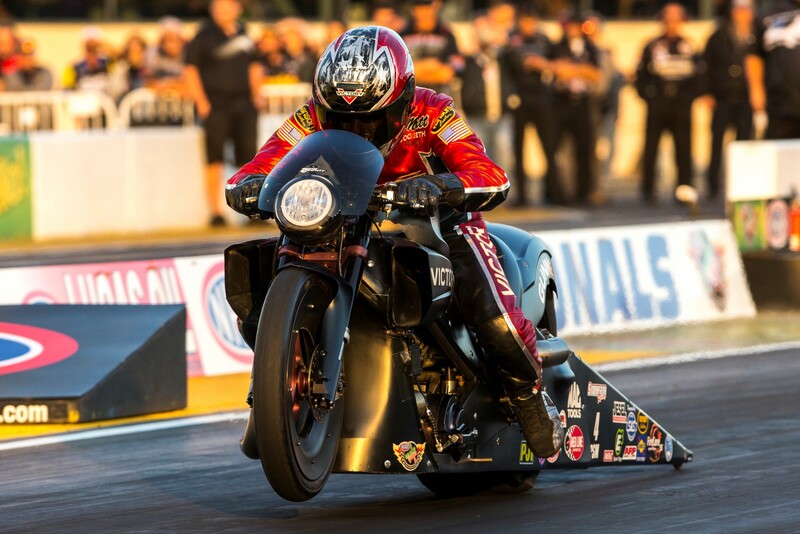 The next event on the NHRA Pro Stock Motorcycle tour is the Chevrolet Performance US Nationals at Indy, the last event where riders can qualify for the 10-bike playoff Countdown. 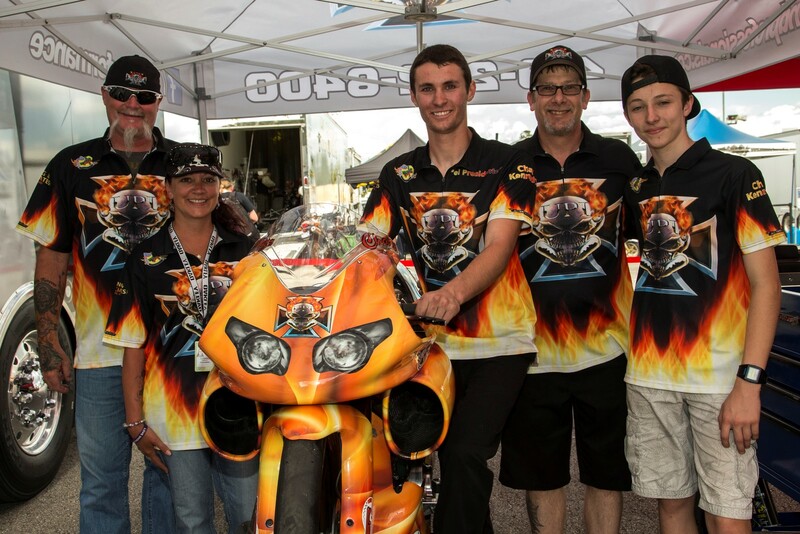 S&S riders currently in the top ten are Hector Arana Jr., Matt Smith, Hector Arana and Scotty Pollacheck. Just outside the top ten are Chip Ellis, 26 points out, Angelle Sampey, 51 points out and Chaz Kennedy and Angie Smith, both with an outside chance at 68 points out. The US Nationals, run over Labor Day weekend, offers 1.5 times the points available at every other NHRA national event.